For a 12 1/2 inch Jack in the Box (12 inches when sewn in a quilt) you need the following cuts. Four 5 1/2 inch by 3 inch rectangles of the B&W print. Eight 3 inch squares of the white-on-white. Four 3 3/8 inch squares of the white-on-white. and two 3 3/8 inch squares of the black. 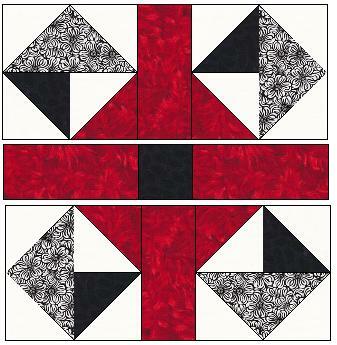 For the center strips you need four 5 1/2 by 2 1/2 inch strips of the red and one 2 1/2 inch square of black. Make four flying geese units. Place a 3 inch w-o-w square on the top of the 5 1/2 by 3 inch rectangle as shown. Sew diagonally from corner to corner. Trim leaving a 1/4 inch seam allowance. Press to the square. Now repeat on the other side of each rectangle using the other 3 inch w-o-w square. 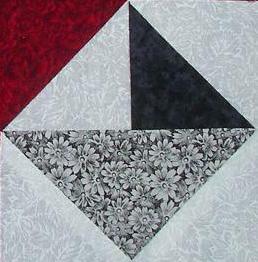 Next come the diagonal half squares (DHS) or half square triangles, which ever you prefer calling them. You can use which ever technique you want to make them, but this is my favorite. First, mark your lightest squares diagonally through the center. (This will be a cutting line when you are finished.) 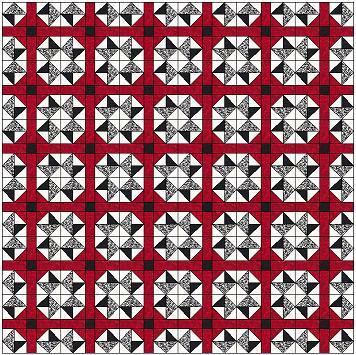 Place your red 3 3/8 inch square, right sides together with the 3 3/8 inch background square. Sew on either side of the drawn line, exactly 1/4 inch from the first line. Cut this square in half on the cutting line. You will now have two diagonal half-squares, which should measure exactly 3 inches. 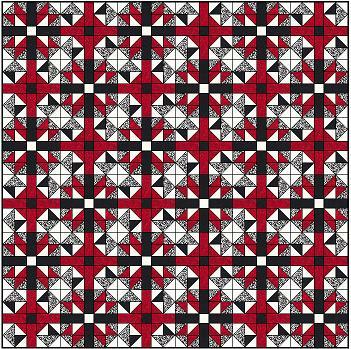 Repeat with the remaining 3 3/8 inch squares. Make four units like this and then four like this . Now sew a red strip between two of the units you just made. Notice how those units are turned, putting the red DHS in the center next to the red strip. Make two units like this. Your finished Jack in the Box block should measure exactly 12 1/2 inches.